We wanted to visit Iceberg Lake and the Ptarmigan Tunnel, two of the most spectacular places in Glacier National Park. However it involves some challenging hiking: the trail to Ptarmigan Tunnel is 5.2 miles each way, with a 2,300-foot gain in elevation. The trail to Iceberg Lake is a 2.2 mile spur off the main trail with an addition 600-foot gain. The total day hike would be 14.8 miles with a total elevation gain of 2,900 feet. We hadn’t done such a long day hike in years, and with bad weather on the way, there was no time to break the hike into two separate days. There wasn’t enough time, too, during our last visit here fourteen years previously (and I always regretted that) so this time we were definitely going for it. Photo, left: Looking north from the north end of the Ptarmigan Tunnel: Elizabeth Lake and the Belly River Valley. 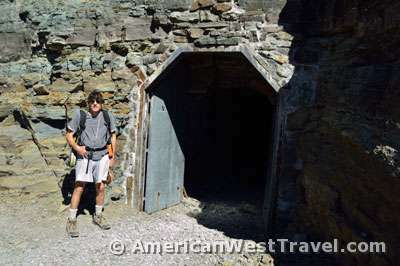 Constructed in the 1930s by the CCC for hikers on foot or horseback, the Ptarmigan Tunnel goes through 240 feet of solid rock and connects the Many Glacier Valley to the Belly River Valley. It is located high on the Ptarmigan Wall and thousands of feet above the floors of both valleys. While the views are stunning at either end of the tunnel, it’s the differences that make it fascinating. Whichever direction you are hiking, when you step through the tunnel, it feels like entering a completely different world. 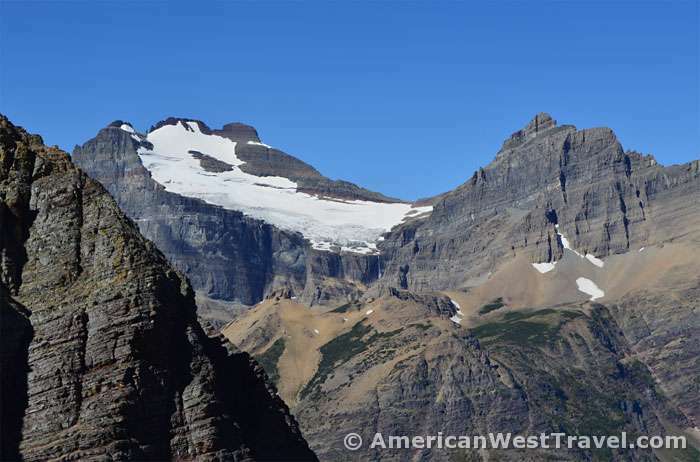 The Ptarmigan Wall (photo, below) is a surprisingly thin ridge of solid rock (240 feet thick at the tunnel) separating the Many Glacier and Belly River valleys and nearly two thousand feet high. It is known as an arête and was created by glaciers carving up both valleys. Much of the trail and the Many Glacier region in general, is prime grizzly bear habitat. The area is generally densely wooded and often lush with bear treats such as huckleberries (similar to a blueberry). 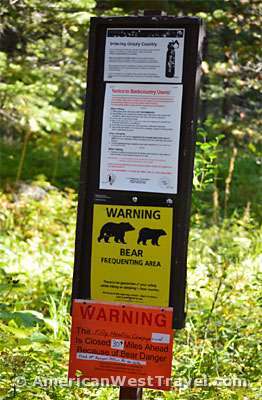 There are many signs regarding visitor safety in bear country, and they ought to be heeded. In particular, all hikers are strongly advised to carry bear spray. Most visitors never see a bear up close but it does occasionally happen. So it is wise to be prepared. Like the famous Highline Trail, the Ptarmigan-Iceberg Trail is extremely popular and busy. The majority of hikers head for Iceberg Lake as it is a less strenuous hike (9.7 miles round-trip, 1,200 feet elevation gain) than Ptarmigan Tunnel. Unlike the Highline Trail which is tremendously scenic every step of the way, this hike is about the fantastic payoff(s) at the trail’s destination(s). 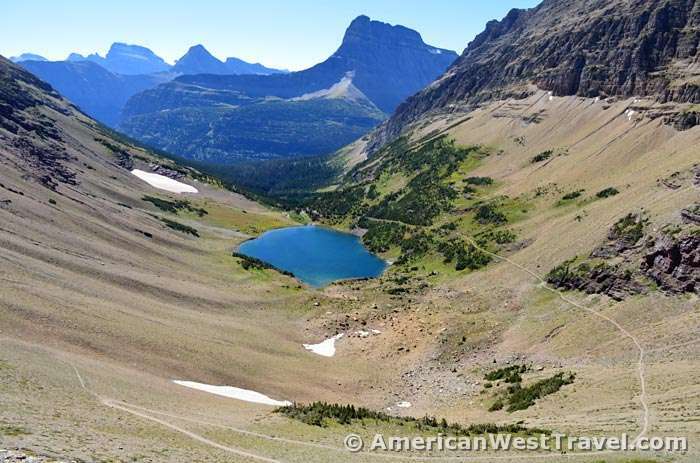 After climbing out of the woods near the parking lot, the first mile or so is a large open valley with outstanding, close views of Many Glacier’s landmark mountains, Mount Grinnell and Swiftcurrent Mountain. As you turn northwest, the Ptarmigan Wall comes into view. At about mile 1.5 you enter dense woods and will remain mostly in the woods for a couple miles. The thick woods would be an easy place to be surprised by a bear, so be aware at all times. At mile 2.5, you arrive at Ptarmigan Falls and a clearing which is a popular rest area where you can look down at the falls (which are difficult to see and photograph from the front due to the woods). The trail junction is a short distance beyond the falls with Ptarmigan Tunnel Trail going to the right. Beyond the junction, the trail climbs very steeply (400 feet in half a mile) through very dense woods laden with huckleberries, very prime grizzly bear habitat. The trail then climbs past timberline and starts to level off. Soon there appear cascades and small waterfalls in the valley just below the trail. There are rough side trails where you can scramble down to the creek. You then arrive at Ptarmigan Lake, a spectacular almost aqua-colored alpine lake. There is a better trail to get down to the lake (where several people are relaxing). The head of the canyon rises spectacularly above the lake. There is an enormous talus slope reaching nearly to the top of the Ptarmigan Wall where the tunnel is located. 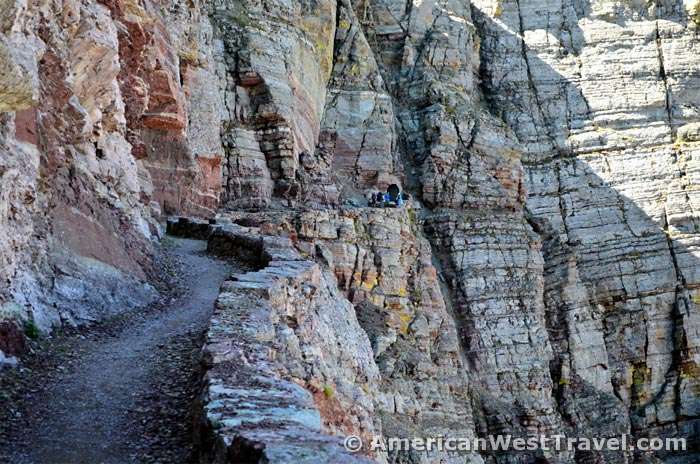 The trail climbs the very steep slope via several very steep switchbacks (climbing 600 feet in under a mile). 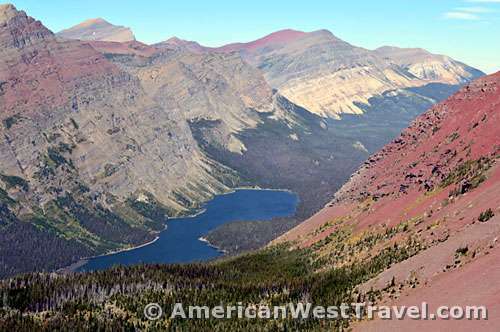 Photo, below: Ptarmigan Lake and the head of the canyon beyond. Look closely, and you can see the trail switchbacking up the huge slope. The area of the (south) tunnel entrance is highlighted. 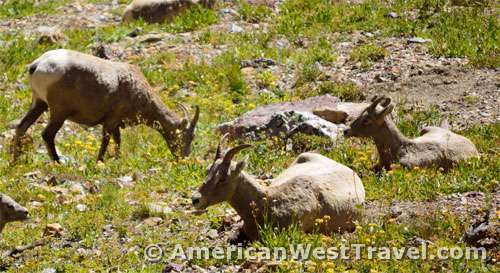 As we pass the lake it becomes apparent that there is a herd of bighorn sheep, females and calves, grazing in the boulder strewn meadow. Interestingly, they blend in well with the rocks and debris, making them difficult to spot. I eventually counted at least 18 animals, and later Gerry changed lenses and got some very good close-ups. The climb up the slope is slow and strenuous but with increasingly huge and spectacular views of the valley below. Because the trail is very narrow and the slope very steep you have a surreal sensation of openness, as if viewing the valley from a plane. (This was also how it felt on the Highline Trail.) Without trees, the U-shape of the valley is quite obvious, indicating it was glacier-carved. The Ptarmigan Tunnel itself doesn’t become visible until you are almost there. Its small opening blends in with the rock wall. Photos, below: Looking west from the north end of the Ptarmigan Tunnel: the Old Sun Glacier atop Mt. Merritt. You need to go about 100 yards down the trail to get this view. Second, photo: From the same spot, a view of the trail and the north entrance to the tunnel (in dead center). Bottom photo: Looking south from the south entrance at Ptarmigan Lake. After getting photos, we return to the other side (where it is sunny and warm) to eat lunch. I already feel exhausted but if we’re going to Iceberg Lake, there are over nine miles of hiking left to do. There is an older guy sitting near me with an ancient external-frame backpack. I wave my ancient round canteen at him and remark that we’re both “old school”. He replies that no, actually we’re both just old. Touché. 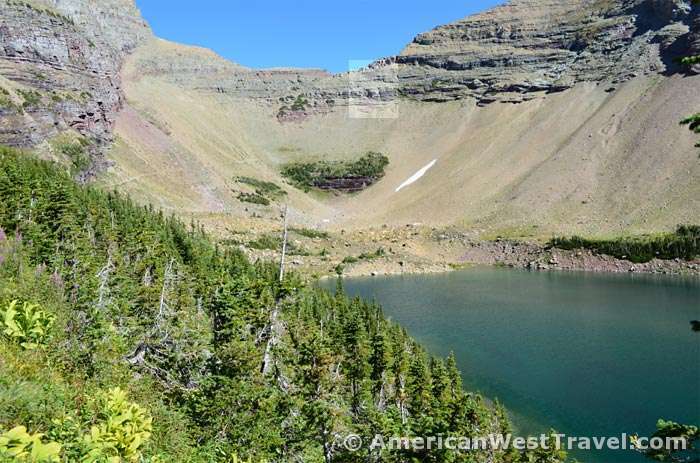 See our feature article Spectacle at Iceberg Lake for the last part of this hike.